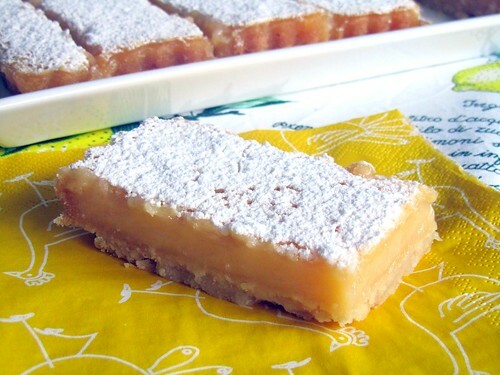 These are the lemon squares of my childhood. My mom has made them for 30 years; the recipe dates back to my 1980-ish church cookbook — you know, the kind where everyone in the congregation submits their best recipes. I love this cookbook dearly because it’s filled with references to margarine, oleo and powdered milk — recipes from another era, clearly handed down through generations. They are not all fancy and gourmet (though some are), but mostly tried and true comfort foods that have graced family tables for decades. In other words, if my house starts on fire, I will run through flames to save this cookbook. There is nothing difficult about these lemon squares, but I’ve always thought the sum of all the ingredients is much more than the recipe’s humble parts. Flour, sugar, butter, lemon…nothing fancy here, but the result is sweet/tart perfection. Preheat oven to 350. Mix butter, 2 cups flour, confectioners sugar and salt as you would a pie crust. (For me this means throw it all into a food processor. Pulse until mixture resembles coarse crumbs. Easy-peasy.) Press mixture into 9x13 pan. Bake 20 minutes. Whisk together filling ingredients until smooth. Pour over baked crust. Bake 25 minutes longer. Let cool completely. Sprinkle with confectioners' sugar to garnish. I think these taste best when chilled for a few hours. Store in the refrigerator. Note: the edges of these have a tendency to brown, so I always cut them off for a nice, clean lemon bar.